What Is Speaker Sensitivity and What Does It Mean? What Does Speaker Sensitivity Mean and Why Is It Important? If there's one speaker specification ever worth looking at, it's the sensitivity rating. Sensitivity tells you how much volume you'll get from a speaker with a given amount of power. Not only can it affect your choice of speaker, but also your choice of stereo receiver/amplifier. Sensitivity is integral to Bluetooth speakers, soundbars, and subwoofers, even though those products may not list the specification. Speaker sensitivity is self-explanatory once you understand how it's measured. Start by placing a measurement microphone or SPL (sound pressure level) meter exactly one meter away from the front of the speaker. 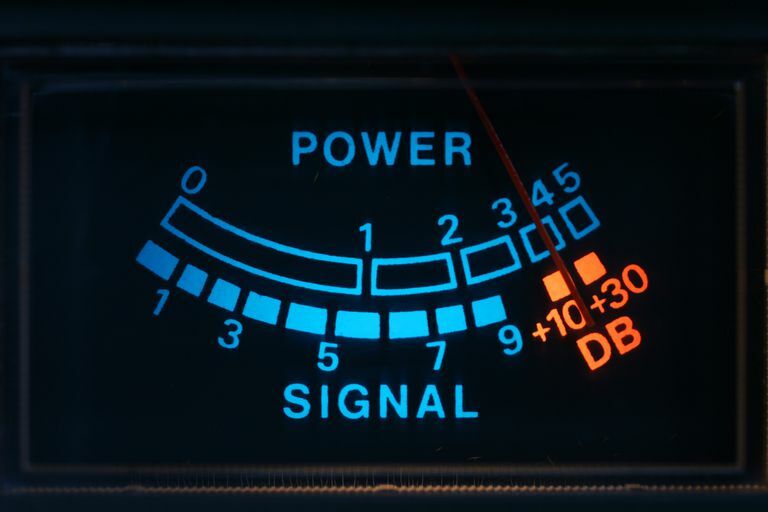 Then connect an amplifier to the speaker and play a signal; you'll want to adjust the level so the amplifier delivers only one watt of power to the speaker. Now observe the results, measured in decibels (dB), on the microphone or SPL meter. That's the sensitivity of the speaker. The higher the sensitivity rating of a speaker, the louder it will play with a certain amount of wattage. For example, some speakers have a sensitivity of around 81 dB or so. This means with one watt of power, they'll deliver just a moderate listening level. Want 84 dB? You'll need two watts – this is due to the fact that every additional 3 dB of volume requires double the power. Want to hit some nice and loud 102 dB peaks in your home theater system? You'll need 128 watts. Sensitivity measurements of 88 dB are about average. Anything below 84 dB is considered rather poor sensitivity. The sensitivity of 92 dB or higher is very good and should be sought after. Are Efficiency and Sensitivity the Same? Yes and no. You'll often see the terms "sensitivity" and "efficiency" used interchangeably in audio, which is ok. Most people should know what you mean when you say a speaker has "89 dB efficiency." Technically, efficiency and sensitivity are different, even though they describe the same concept. Sensitivity specifications can be converted to efficiency specifications and vice-versa. Efficiency is the amount of power going into a speaker that is actually converted into sound. This value is usually less than one percent, which tells you that most of the power sent to a speaker ends up as heat and not sound. It's rare for a speaker manufacturer to describe in detail how they measure sensitivity. Most prefer to tell you what you already know; the measurement was done at one watt at a one-meter distance. Unfortunately, sensitivity measurements can be performed in a variety of ways. You can measure sensitivity with pink noise. However, pink noise fluctuates in level, which means it's not very precise unless you have a meter that performs averages over several seconds. Pink noise also doesn't permit much in the way of limiting measurement to a specific band of audio. For example, a speaker that has its bass boosted by +10 dB will exhibit a higher sensitivity rating, But it's basically "cheating" because of all the unwanted bass. One could apply weighting curves – such as A-weighting, which focuses on sounds between about 500 Hz and 10 kHz – to an SPL meter to filter out the frequency extremes. But that's added work. Many prefer to evaluate sensitivity by taking on-axis frequency response measurements of speakers at a set voltage. Then you would average all the response data points between 300 Hz and 3,000 Hz. This approach is very good at delivering repeatable results with accuracy down to about 0.1 dB. But then there's the question of whether sensitivity measurements were done anechoically or in-room. An anechoic measurement considers only the sound emitted by the speaker and ignores reflections from other objects. This is a favored technique, being that it's repeatable and precise. However, in-room measurements give you a more "real world" picture of the sound levels emitted by a speaker. But in-room measurements typically give you an extra 3 dB or so. Sadly, most manufacturers don't tell you if their sensitivity measurements are anechoic or in-room – the best case is when they give you both so you can see for yourself. What Does This Have to Do With Soundbars and Bluetooth Speakers? Ever notice that internally-powered speakers, such as subwoofers, soundbars, and Bluetooth speakers, almost never list their sensitivity? These speakers are considered "closed systems," meaning that sensitivity (or even the power rating) doesn't matter as much as the total volume capable by the unit. It would be nice to see sensitivity ratings for the speaker drivers used in these products. Manufacturers rarely hesitate to specify the power of internal amplifiers, always touting impressive numbers such as 300 W for an inexpensive soundbar or 1,000 W for a home-theater-in-a-box system. The manufacturer almost never tells you how the power is measured (maximum distortion level, load impedance, etc.) or if the unit's power supply can actually deliver that much juice. The amplifier power rating doesn't tell you how loud the unit will play unless you also know the sensitivity of the speaker drivers. Even if the amp does put out that much power, you don't know that the speaker drivers can handle the power. Soundbar and Bluetooth speaker drivers tend to be rather inexpensive. Let's say a soundbar, rated at 250 W, is putting out 30 watts-per-channel in actual use. If the soundbar uses very cheap drivers – let's go with 82 dB sensitivity – then the theoretical output is about 97 dB. That would be a pretty satisfying level for gaming and action movies! But there's just one problem; those drivers might only be able to handle 10 watts, which would limit the soundbar to about 92 dB. And that's not really loud enough for anything more than casual TV watching. If the soundbar has drivers rated at 90 dB sensitivity, then you need only eight watts to nudge them to 99 dB. And eight watts of power is far less likely to push the drivers past their limits. The logical conclusion to reach here is that internally-amplified products, such as soundbars, Bluetooth speakers, and subwoofers, should be rated by the total volume they can deliver and not by pure wattage. An SPL rating on a soundbar, Bluetooth speaker, or subwoofer is meaningful because it gives you a real-world idea of what volume levels the products can achieve. A wattage rating does not. Here's another example. Hsu Research's VTF-15H subwoofer has a 350-watt amp and puts out an average of 123.2 dB SPL between 40 and 63 Hz. Sunfire's Atmos subwoofer – a much smaller design that is far less efficient – has a 1,400-watt amp, yet averages only 108.4 dB SPL between 40 and 63 Hz. Clearly, wattage doesn't tell the story here. It doesn't even come close. As of 2017, there's no industry standard for SPL ratings for active products, although there are reasonable practices. One way to do it is to turn the product up to the maximum level it can achieve before distortion becomes objectionable (many, if not most, soundbars and Bluetooth speakers can run at full volume without objectionable distortion), then measure the output at one meter using a -10 dB pink noise signal. Of course, deciding what level of distortion is objectionable is subjective; the manufacturer could use actual distortion measurements, taken at the speaker driver, instead. Obviously, there's a need for an industry panel to create practices and standards for measuring the active output of audio products. This is what happened with the CEA-2010 standard for subwoofers. Because of that standard, we can now get a very good idea of how loud a subwoofer will actually play. You may wonder why manufacturers don't produce speakers that are as sensitive as possible. It's typically because compromises need to be made in order to achieve certain levels of sensitivity. For example, the cone in a woofer/driver could be lightened to improve sensitivity. But this likely results in a more flexible cone, which would increase overall distortion. And when speaker engineers go about eliminating unwanted peaks in a speaker's response, they usually have to reduce sensitivity. So it's aspects like these that manufacturers have to balance out. But with all things considered, choosing a speaker with a higher sensitivity rating is usually a better choice. You may end up paying a little bit more, but it will be worth it in the end.